With its tall cupola, half-fan windows and oculi, this red-brick Georgian-style building, which is also known as 1015 Park Avenue, is one of the prettiest and most charming mansions in the city. It is surprising, therefore, that it remained vacant for a decade or so at the end of the 20th and the beginning of the 21st Century, a fate that also befell another Georgian-style, red-brick mansion, the Thomas Howell residence designed in 1920 by Walter Lund and Julius F. Gayler, further south at 603 Park Avenue on the northeast corner at 64th Street. This is the far more attractive building, because of its dormers and white window frames whereas the Howell house is more sedate and bland. 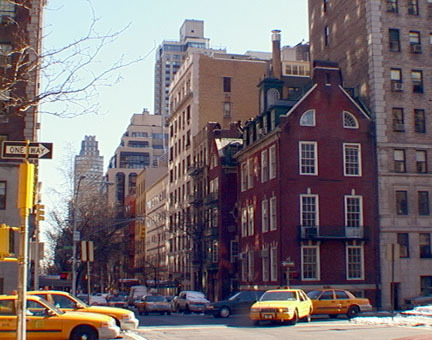 Trager also noted that Amos Pinchot had sold Lewis Gouverneur Morris the 25 1/2-by-82-foot lot on the southeast corner at this intersection, directly across from the sidestreet entrance of 1021 Park Avenue. 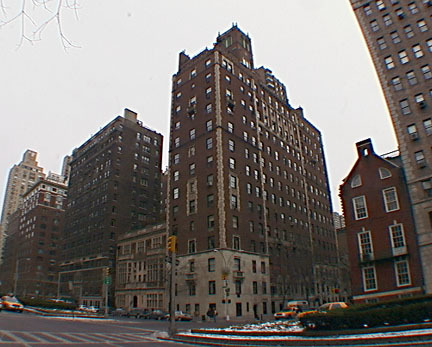 Morris had the building on it razed and replaced with a building designed by Ernest Flagg that he moved into from his former residence at 77 Madison Avenue. The new, gable, dark red-brick house had hip-roofed dormer windows, a cupola over its elevator tower, and a garage in its east wing. 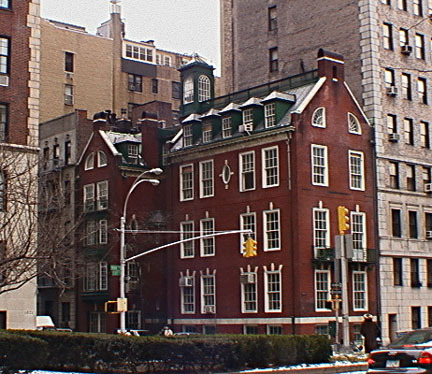 Trager wrote that the daughters of Morris sold the townhouse in 1967 to the New World Foundation, "established in 1954 to carry out the testamentary wishes of the reaper heiress, Anita McCormick Blaine." Lewis Gouverneur Morris, Mr. Trager continued, was a descendent of "Gouverneur Morris of Morrisania, who helped draft the Articles of Confederation; of the first governor of New Jersey; and of a signer of the Declaration of Independence, both named Lewis Morris." "Lewis Gouverneur Morris was in the Harvard class of 1906, a member of the New York Stock Exchange, and a partner in the brokerage firm of Morris & Pope, organized in 1915. The firm failed in 1917 and Morris, in consequence, went to jail in 1921. When he died in 1967 at age eighty-five, his obitiuary in the Times noted that he had been 'confined in $22,000 bond in White Plains from June 18, 1921 to October 5, 1921.' He was 'discharged as an almost insolvent debtor after petitioning the court that his only assets were clothing and other personal effects, $30 in cash, and two tennis racquets.' Morris first wife, the former Natalie Lawlor Bailey, died in 1935; he married Princess de Branganca, the former Miss Anita Stewart, in 1946, and his death occured at Malbon, his Newport, Rhode Island, estate. The Times obit noted that he also maintained a residence at '1510' (it meant 1015) Park Avenue and had been a trustee of the Museum of the City of New York." Architect Flagg was best-known for the great Singer Building at 149 Broadway, which was for a while the tallest building in the world and was the tallest building in the world ever to be demolished when it was demolished in 1970. This building was sold by the daughters of Lewis Gouverneur Morris in 1967 to Anita McCormick Blair whose New World Foundation was created in 1954 to revitalize "the institutions of community and public life grown increasingly fragile in the face of massive loss of federal dollars and inadequate private funds," Mr. Trager wrote. One of the most distinctive and elegant buildings on the avenue, 1021 Park Avenue was erected in 1929 as a cooperative.That 14-story building, shown above, has only 27 apartments and was designed by Rosario Candela and Kenneth M. Murchison and erected by John and Joseph Campagna, the son of Anthony Campagna, one of the citys most important developers of luxury residential buildings. Candela was the leading architect of luxury apartment buildings of his era. It is just to the south of the charming former town house at 1025 Park Avenue of Reginald deKoven, a composer, designed in 1912 by John Russell Pope in Jacobean style (see The City Review article). 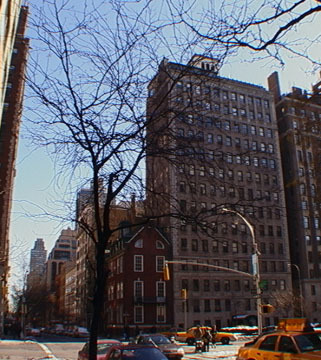 The former New World Foundation building is across the avenue from the Park Avenue Christian Church, designed by Cram, Goodhue & Ferguson in 1911. "The radical English architect and urban designer Richard Norman Shaw (1831-1912) converted Georgian fantasies into such rich and complex places as this. A sprightly collision of quater-round windows, widow walks, and dormers flying in all directions. Among Flagg's best." In 2002, the building underwent handsome renovations.